It’s holiday time in the U.S. and most families were together last week, at least for a few days. It is a rich time to build relationships with family. Don't forget, we’re modeling the definition of family and extended family for our kids. Jeanie and I played host to nearly 20 members of the Beadle family from Baton Rouge for Thanksgiving. It’s an Ozarks tradition that goes back nearly 25 years. The size of the family grows every year and this year we had the first of many grandchildren present. The time together was absolutely a blast. We built a bon-fire, watched lots of football, went to Silver Dollar City and ate really well. Mostly, we just spent time together. Like any family, we all have our quirks, but there was lot’s of love passed around this past week and we tearfully said our goodbyes Sunday morning. I think the greatest challenge over the holidays is “connecting.” It’s just so easy to stare at the TV and never engage with extended family. Truth is, most people aren't comfortable being vulnerable with their own families. It’s easier to be judgmental and impatient. My theory is that the things that bother us the most are those traits that we see in others that remind us of our own faults. It’s hard to look at ourself in a mirror. But that’s a part of what makes families so good for us. They keep us honest and teachable. But life goes so quickly and if we’re not careful, we’ll miss it. When my dad passed away in 1988, it was devastating. He died suddenly of as heart attack. I had no idea he would leave us so quickly. The goodbye was difficult. But it was cushioned by a fairly empty suitcase of issues with him. I had resolved years earlier to love him, faults and all. I tried to make the choice to love him when we were together during those later years. What is it with family? Why do we tend to be so judgmental and comparing with those we love the most? We show more understanding to strangers and acquaintances than we do our own flesh and blood. 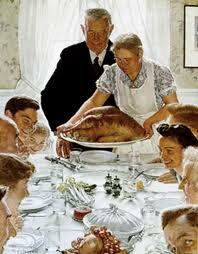 And remember, the eyes of our kids are taking notes as they watch us interact with family members. They are listening when they hear us discussing issues about our relatives. Don't forget that the way we treat family now is the way our kids will treat us later on. Let’s be a good example for our kids in words and deeds. Let’s enjoy the holidays and not shy away from good solid time with those cousins, aunts and uncles whom we rarely see. Let’s not be afraid to look in the mirror- it only gives us a clearer view.